So, if you haven’t had a chance to pick EW up yet, here’s all the info in one place – and what it all could mean for Captain Marvel and beyond. Shape-shifting aliens The Skrulls have infiltrated Earth. As you can imagine, this is not good news. 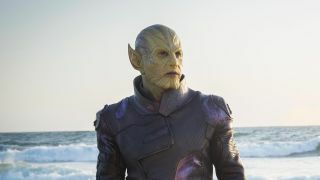 The green-skinned extraterrestrials have washed up on a beach somewhere and are probably going to pull off a master plan that involves Skrull head honcho Talos, played by Ben Mendelsohn. He’s already made his way to what looks like a bustling city and, if you know your comics, you know a Skrull invasion spells bad news for everyone as they can take on the form of anyone – even your favourite Avengers – and no one would know the difference for years and years. Nick Fury is young again and has two eyes! What would a MCU movie be without some A-list talent drafted in? Here’s your first look at Jude Law as Carol’s mentor Mar-Vell, but what are we supposed to make of the fact he’s sharing a room with Ronan? As for that new MCU hero? Say hello to Carol’s friend and fellow Air Force pilot Maria Rambeau (actor’s name) - who offers a pretty deep cut Marvel reference. Described as a “single mother”, in the comics, her daughter Monica goes on to become the superhero Photon. And guess what Maria’s callsign is? That’s right: Photon. Could we see another female superhero join the MCU ranks soon? Here’s hoping! Crap ‘90s fashion, complete with Nine Inch Nails t-shirt? Check. Air Force fatigues? Check. The first full look at the superhero costume? Check. Brie Larson can seemingly wear anything and still look effortlessly cool, but it’s her Captain Marvel costume that impresses the most. The colours pop and, most importantly, she looks raring to go into battle. Thanos had better watch his back, that’s all I’m saying. There's plenty more where that came from: here are the upcoming movies for the latter half of 2018 and beyond.